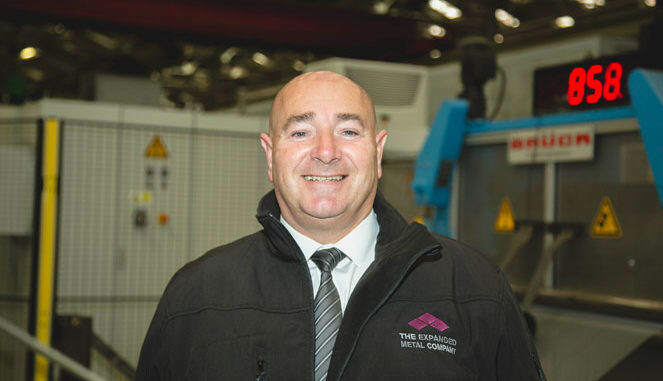 Expanded metal mesh manufacturer the Expanded Metal Company has bolstered its senior team with the appointment of a new operations manager. Lee Fleetham has joined the Hartlepool-based company – a specialist in the manufacture of expanded metal products – to oversee the operations of the company, develop and review strategies, and manage process improvement. His role includes overseeing lean production techniques, managing continuous improvement programmes and to develop high-performance teams. The Expanded Metal Company supplies a wide range of expanded metal mesh products from its 25,000sqm site in Hartlepool and serves a wide range of industrial sectors, including construction, filtration, engineering, automotive, aerospace and architecture. The Expanded Metal Company also serves the security sector and has its own security range, ExMesh, which offers a wide range of innovative fencing systems and security solutions. The company has a rich industrial heritage dating back to 1889 and was founded by John French Golding, the inventor and patentee of expanded metal. Fleetham, from the Hartlepool area has a breadth of industry expertise, having worked in the manufacturing industry for most of his career. He worked at Industrial Building Components (IBC), a leading door manufacturer and supplier and formerly part of The Expamet International Group, for ten years from 1988 through to 1998, as a team leader and supervisor. He then spent 19 years at Expamet Building Products, a manufacturer and supplier of metal building products, initially as production manager before working his way up to a general manager’s post where he had overall responsibility for production processes along with production planning, health & safety management, transport, business strategy and manufacturing development. Fleetham has a Professional Diploma in Management Studies and a Professional Certificate in Management along with other previous qualifications, NEBOSH (National Examination Board in Occupational Safety and Health) and IOSH (Institution of Occupational Safety and Health) to name but a few. “The Expanded Metal Company is a pioneer in the metal mesh industry, with a long-established track record in product innovation and manufacturing, and I am therefore delighted to be joining the team,” said Fleetham. “Having worked in the building and construction products sector for almost three decades, I am extremely passionate about the industry and I take great pride in being able to contribute to The Expanded Metal Company’s success and continued development.